Master key concepts. Prepare for exams. Learn at your ownpace. How does memory work? What kind of drugs can impair memory? Howdoes the brain change with age? What are the tricks to improvingeveryday memory? With Memory: A Self-Teaching Guide, you'lldiscover the answers to these questions and many more. 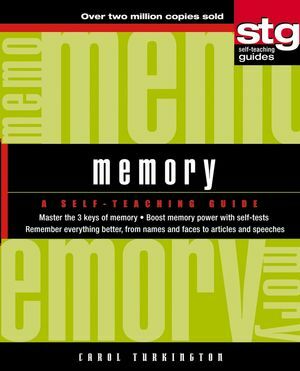 Carol Turkington provides memory-boosting activities related tostudy skills, foreign languages, names and faces, numbers,speeches, and age-related memory loss. The techniques presentedwill enable anyone to boost memory power and, by using Turkington'sessential memory keys, cultivate tools for remembering that willlast a lifetime. The step-by-step, clearly structured format ofMemory makes it fully accessible, providing an easily understood,comprehensive overview. Like all Self-Teaching Guides, Memory allows you to build graduallyon what you have learned-at your own pace. Questions and self-testsreinforce the information in each chapter and allow you to skipahead or focus on specific areas of concern. Packed with useful,up-to-date information, this clear, concise volume is a valuablelearning tool and reference source for anyone who wants to improvehis or her memory. CAROL TURKINGTON is a health and psychology writer. Among her more than twenty-five books are 12 Steps to a Better Memory, The Encyclopedia of Memory and Memory Disorders, and The Brain Encyclopedia. A former newspaper writer and editor, she spent three years as a medical writer/editor at Duke University Medical Center and five years as senior writer in clinical psychology for the American Psychological Association in Washington, D.C.
1 What Is Memory and What Can It Do for You? 2 The Keys to a Better Memory. 4 Improving Your Study Methods. 5 Learning and Remembering Foreign Languages. 6 Remembering Names and Faces. 9 Maintaining Memory as You Age. Appendix 1: Associations Dealing with Memory Problems. Appendix 2: Helpful Web Sites. Appendix 3: Read More about It.